About – Who is this Ramona person? It seems Emmett G. McQuinn (son of J.M. McQuinn) was in charge of the advertising and marketing. What a fine job he did! You can see The Hoosier all over the place – Ladies Home Journal, House Beautiful and in images in cook books and kitchen designs. 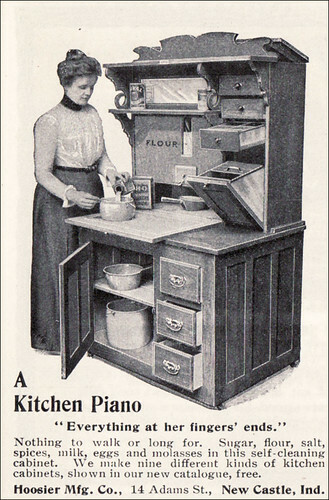 WITHOUT the strong right arm of the Hoosier Kitchen Cabinet no woman can do her full bit in saving food for our nation’s fighters. Nor can she save extra hours, extra steps, and extra effort in her kitchen work. The many time, food and labor-saving features of the Hoosier Kitchen Cabinet together with the valuable kitchen short-cuts invented by the talented women who compose the Hoosier Council of Kitchen Scientists have made the Hoosier a kitchen necessity – not a luxury. See these Hoosier Kitchen Cabinets at the Hoosier dealer’s in your city. Learn for yourself how the Hoosier saves you food, time and labor. Then you will never be content without one. What exactly is a Hoosier cabinet? I love the term “a culinary work-station”. It allowed owners to maintain an efficient and clutter-free kitchen by centralizing utensils, cookware, tools, and ingredients all the while providing a space in which to prepare the meals of the day. A true modern American innovation of the turn-of-the century. The Hoosier takes the design idea from what was known as a baker’s cabinet. The basic wood piece has an upper and lower cabinet. These had closing cupboards and drawers for storage. There were often “possum belly” drawers to hold flour and sugar. These drawers would be of tin to protect the contents from pests. The lower section usually had a waist height pull out cutting or pastry board. The counter top was first made of wood, and then metal (zinc, aluminum or porcelain). The most fantastic thing are the accessories. Flour sifters, bread drawers lined with enamel, bread boards, storage containers, different racks and hooks, salt and peppers, ironing boards and broom closets. Hoosier also used glass from Sneath Glass Company to make jars. The earlier glass canisters were squarer in shape. During the early 1920s the shapes became more rounded. As time went on more additions were made to make the cabinet more efficient. Ironing boards, umbrella stands and other additions were created as the manufacturers’ imaginations soared. Once the Hoosier cabinet took off the company built over four million cabinets between 1900 and 1940. Other companies started building their own styles and many were being home made by cabinet makers. Who made them doesn’t matter, they all have been termed as “The Hoosier Cabinet”. Before I venture on to The Hoosier Cabinet, I wanted to take a look at a typical kitchen and what a woman’s life was like in 1890. Respectability was measured by cleanliness. For the turn-of-century woman appearances were everything: hands, faces, outer clothing, doorsteps and entrances were suppose to be kept spotless, as were reputations. Women who worked on the farm had a damn hard life – canning, butchering, sewing and mending, baking and cooking, keeping the stove hot all day, laundering, sweeping the chimney, filling the gas and oil lamps, hauling water and tending the garden and the children. Before modern detergents it could take a day to clean one room thoroughly. Laundry work took up 3 – 4 days every fortnight. Give me a break! It’s no wonder 47 was considered old age! Leisure time for a wife at least was at a premium and religion could play a large part, with many Methodists for example expected to attend chapel twice a day on a Sunday and at least one class during the week. This was often impossible in a larger family (many women were pregnant on average every 18 months and 8 – 10 children were not uncommon with 2 – 3 probably dead in their early years) were most women (unless they could afford a nurse) were almost continually nursing a baby or sick child. Although rather hidden, evidence is slowly emerging that many women of the time were often ill or depressed (no frickin wonder) for much of their lives, with only minimal treatments available. electric refrigeration furnished the homes of the wealthy, but the middle-class would not see truly modern refrigerators until 1922. 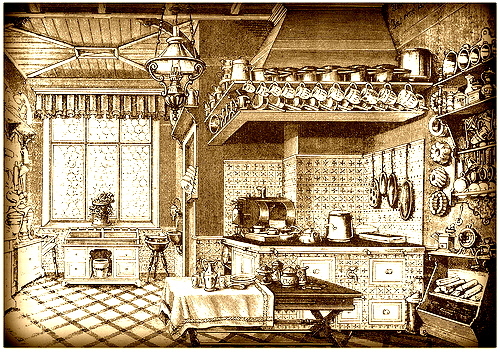 A perfect sized Victorian (which I consider a upper-middle class) kitchen was thought to be 15′ X 17′. Big enough for movement but not too large. It contained a sink, stove, tables, dresser and hopefully connected to a pantry, cold room or a cellar. Hard wood floors, washable or tiled surfaces, an iron sink, a portable stove rather than a set range, additional tables and a pump or running water were things every home maker yearn for. Below is a photo of a woman’s tenement kitchen. While doing research for this post I feel nauseous. The more I read, the more disgusted I am. Woman had no rights, no votes and I’m moving on to The Hoosier Cabinet before I throw up. I’ve always wanted a Hoosier Cabinet (after I found out what it was). Besides being a big, honkin piece of furniture, it has a function besides hiding all your kitchen clutter. This week we’ll journey to the land of Hoosier’s and get a glimps of how these pieces fit in the turn-of-the-century kitchen. After producing a number of experimental models, Wales selected one for manufacturing. He then changed the company name to Kelvinator Company in honor of Lord Kelvin, the discoverer of “absolute zero” – the standard temperature basis for modern mechanical refrigeration. To house the new electric refrigerator cooling device, Wales used the best cabinet on the market at the time – the Leonard refrigerator cabinet. By 1923, Kelvinator held 80% of the market for electric refrigerators. In 1926, Leonard merged with Kelvinator. Also in 1926, the company acquired Nizer, the largest builder of commercial ice cream cabinets marking its entry to the commercial refrigeration business. I find it interesting that we see refrigerators, washing machines and ranges that are obviously made after 1926 with the Leonard name (rather than Kelvinator). Looks like, the Leonard brand of appliances continued to be sold exclusively through Leonard dealers, as well as through Canadian and English dealers. Death yesterday afternoon claimed CHARLES H. LEONARD, pioneer refrigerator manufacturer at his home 455 Morris Ave., SE. He had been in failing health several months and was unconscious for several hours preceding the end. Funeral services will be held from the residence Thursday at 2 p.m. with Rev. A. W. Wishart, pastor of Fountain Street Baptist church officiating. Burial will be in Fulton st. cemetery. CHARLES HEMAN LEONARD (1848-1927) was born in Grand Rapids, MI, the son of HEMAN LEONARD (1812-1884) and JANE GOODRICH (1823-1862). Charles married EMMA JANE CARR (1851-1925) on 15 October 1873. Emma was born in Plainfield, Will Co., IL, the daughter of JAMES WEBSTER CARR (1824-1875) and DOROTHY JANE GOODHUE (1828-1891). Charles and Emma are both buried in FULTON STREET CEMETERY in Grand Rapids, Kent Co., MI. Born in Grand Rapids Jan. 15, 1848, Mr. Leonard was a son of MR. AND MRS. HERMAN [HEMAN] LEONARD, who came here from Parma, N.Y. in 1842, traveling most of the way by stage coach. Following his graduation from the Grand Rapids high school in 1866 with the fourth class to receive diplomas, Mr. Leonard was employed in his father’s grocery store, which was located on the site of the present Houseman & Jones establishment. Later he was taken into partnership, the concern becoming H. LEONARD & SONS and including the late Fred H. and Frank E. LEONARD. The present building of the firm was erected in 1883, occupying the site of the Leonard homestead. The stock of the store, which had changed from groceries to crockery and house fittings, included refrigerators. Charles Leonard had one of these, a device made in Indiana, sent to his home soon after his marriage. After a time, Mrs. Leonard was informed by her servant that its cleansing represented a problem too difficult for her, and Mr. Leonard always of an inventive turn, set about to produce a refrigerator not only easy to keep clean, but to save ice. He devised a dry air, self-circulating interior ventilation refrigerator and in 1880 took out a patent on it. The new type of refrigerator was manufactured for two years at the William A. Berkey factory under contract and then a factory was established on the old gas works property extending from Ottawa ave. to Market ave. When this plant was outgrown by the expansion of the business a new location of 26 acres on Clyde Park ave. was purchased and one of the largest refrigerator factories in the world was established there. The old plant was converted into an industrial building. In 1926 the GRAND RAPIDS REFRIGERATOR COMPANY was purchased by the Electric Refrigerator corporation as its third unit, the others being the Nizer and Kelvinator corporations, Detroit. Charles H. Leonard headed the Grand Rapids Refrigerator company when the crockery and refrigerator departments of H. Leonard & Son were separated in 1893, but interests of the brothers were not divided. With the purchase of the property by the Electric Refrigerator corporation Mr. Leonard became a member of the board of directors of the new management. Leonard Refrigerator Company – Late 19th or early 20th century workers producing ice boxes at Leonard Refrigerator. One of the original members of the Grand Rapids Board of Trade, which later was reorganized as the Grand Rapids Association of Commerce, Mr. Leonard was active in civic matters and especially in Grand river improvement. He was one of the largest contributors to the capital invested in river shipping. When pure water was a civic issue, he advocated sand filtration. Having visited the St. Louis world’s fair, where he saw a modern filtration plant in operation, he made an 8-foot model of the plant, which aroused much interest in the local water campaign. Mr. Leonard was a member of the board of education in 1911-12. He advocated daylight saving more than 20 years before it was adopted and was instrumental in bringing about establishment of retail markets for the city. He was the first to use the electric arc light in Grand Rapids, employing this while construction was being rushed on the new crockery and grocery store on Monroe ave. Mr. Leonard also was an early advocate of manual training in the city schools and for many years before its adoption had favored prohibition from an economic standpoint. Mr. Leonard served for a time as chairman of the board of trustees of Fountain Street Baptist church. He was granted patents on many inventions, some of which were used in the refrigerator business, while others were never utilized. At one time he manufactured a portable galvanized voting booth with two doors, such as were required by law at the time. These were purchased from him by the city. He was a member of Sons of the American Revolution and a staunch Republican. Photographic postcard showing Leonard Street Produce Market, Grand Rapids, Mich. Shows vegetables displayed on counters in booths, with a center aisle. Light poles down the center aisle, full of people. Dec. 9, 1932 purchase date stamp on back. Bryant's Stove and Music Inc.